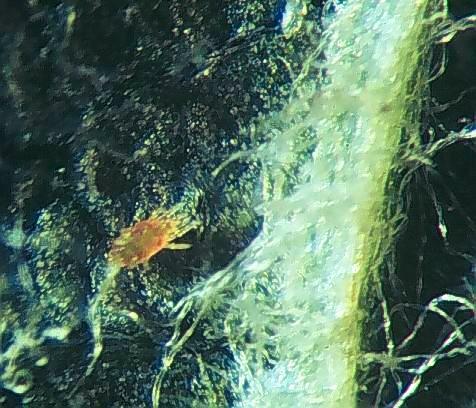 Several species of predatory mites occur on apple, potentially controlling populations of European red mites, two-spotted spider mites, and apple rust mites. 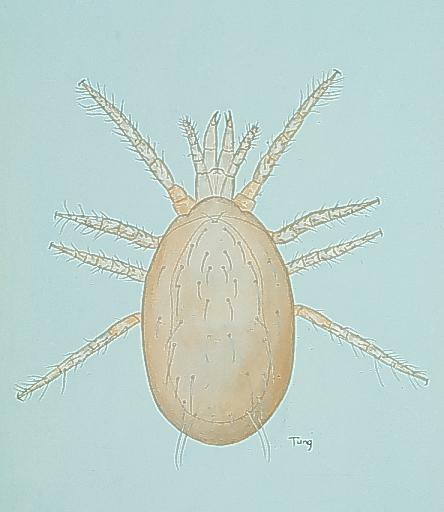 The most commonly observed in North Carolina is the Phytoseiid mite Neoseiulus fallacis (formerly Amblyseius fallacis) and, to a much lesser degree, the Stigmaeid mite Zetzellia mali. Both are smaller than European red mites (around 1/100 to 1/50 inch (0.25 to 0.5mm) long) and range from clear yellow to deep red (after feeding). N. fallacis adult with eggs. Adult N. fallacis females overwinter in soil or debris, becoming active in spring. Each female lives approximately 20 days and will lay 40 to 60 oval, translucent eggs on the bottoms of leaves. Each egg hatches into a six-legged larval stage that lasts about 1 day and does not feed. It then molts into successive protonymph, deutonymph, and adult stages that all have eight legs. The time from egg deposition to adult is about 51/2 days under normal summer conditions, with 6 or more generations occurring over the course of a season. Z. mali adult females overwinter under bark scales, sometimes in clusters of up to 150. They become active in spring and soon lay eggs that take about 16 days to develop into adults. There are usually 3 to 4 overlapping generations per year. Recent research suggests that neither of these predators overwinters to a significant degree within orchards in North Carolina, so they must be reestablished in the spring. Hence, practices that delay the buildup of pest mites and enable predators to increase before mites become a problem will favor biological control. The two most effective practices are applying a delayed dormant oil spray and avoiding insecticides toxic to these predators. A female N. fallacis consumes about 80 total prey over the course of her lifetime. 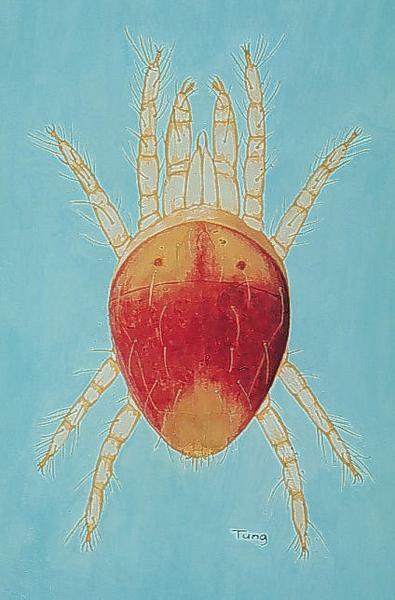 Z. mali is a less effective predator, being slower to increase in population and more inclined to prey on apple rust mites than European red mites or twospotted spider mites. 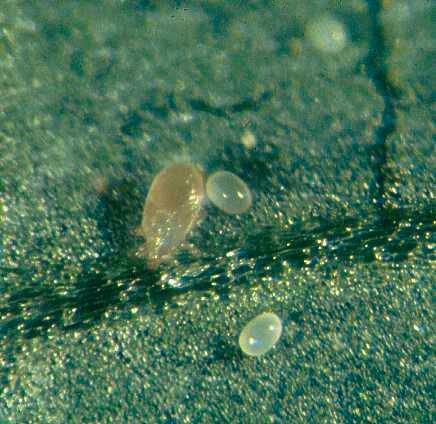 It can survive on foods other than mites, however, and can therefore be an effective complement to N. fallacis for long-term control. 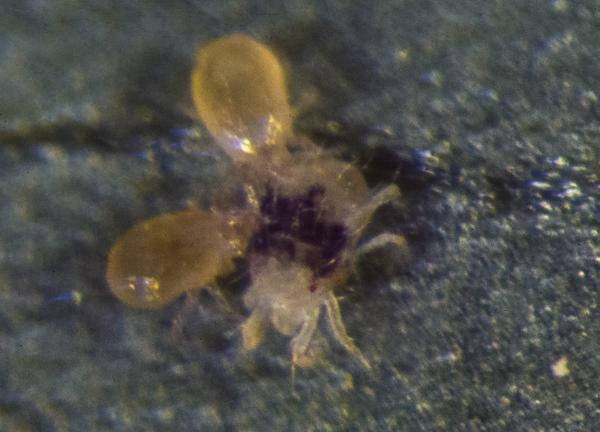 N. fallacis attacking twospotted spider mite.